The matter in the Universe (its barionic component) is concentrated mainly in stars. Inside galaxies, stars contain more than 90% of the matter, and in galactic clusters, due to the existence of intercluster gas, stars contain more than 70% of the matter. The presence of heavy elements (heavier than carbon) in the intercluster gas, with an abundance of the order of one third of solar gas, indicates that almost all barionic matter in the Universe went through a stellar stage. According to modern views, the enrichment of intercluster gas by heavy elements happens due to outflow of matter from galaxies, where the production of heavy elements takes place due to stellar evolution. It follows from the cosmological models of a hot Universe that only hydrogen and helium, with very small additions of lithium, beryllium and boron, were produced in the Big Bang. 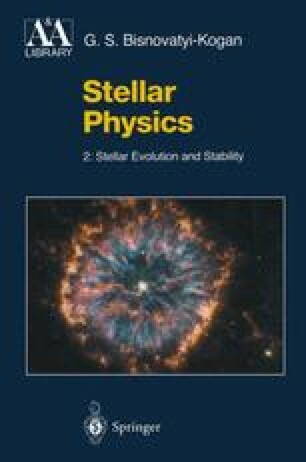 All heavier elements, starting from carbon, are produced as a result of stellar evolution (see Sect. 4.4, Vol. 1).